This is my newest painting, which I call "Lunch Line". These birds were all lined up on a board walk near the marina here in Melbourne. I couldn't resist painting them. I really liked the rhythms and patterns of the birds, the shadow of the railing and the ripples in the water. 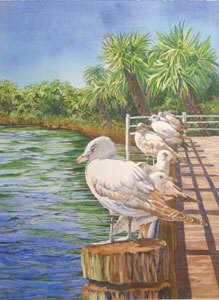 It was also fun to create the soft textures in the birds and to try to give each one a little personality. 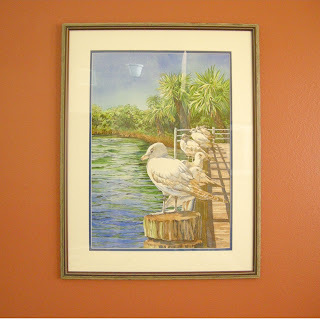 We matted and framed the piece with a wooden frame that is very complimentary to the wood in the dock and palm trees. The overall dimensions with the frame measures 36 inches tall and 28 inches wide. Let me know what you think! A new lesson will be posted soon. I was in Michigan for a two week vacation, so I am just now catching up. I have a lesson painted, and photographed, but I need to work on the descriptions. Stay tuned and you can paint along as we work on some "Sunlit Coconuts". To see more of my work, please visit my website and my etsy shop.